A few months ago one of the hard drives in my main computer failed, it wasn’t the drive with Windows installed (so the computer still worked), it was the 3TB drive where all my photos and videos were stored. This could have been a disaster of lost memories, but thankfully I’m over cautious with this sort of thing and have multiple back-ups of my important data. While no files were lost, finding somewhere new to save my recovered data was a bit of a challenge. I had to squeeze information onto what was an exclusive boot drive, plus another smaller x-laptop drive I’d installed into the desktop case. It was time to start thinking about my data storage. 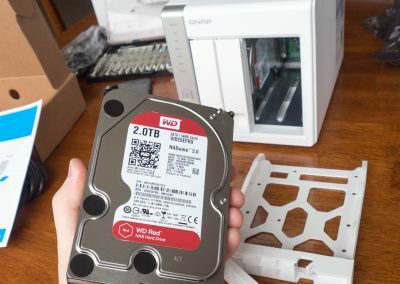 Do I go out and buy another large capacity hard drive? Or should I go for external storage with built in redundancy that connects to my home network? I decided to look for a NAS – Network Attached Storage. A NAS box can come in many different configurations, usually with the capability to take multiple hard drives to offer some sort of redundancy. Redundancy is a fancy way of saying a “safety net”, if one of the drives fails you wont loose your data. Rather than connecting to your computer, the NAS connects to your home network and is accessible to any computer on the network, or even over the internet if you choose. Looking for around six terabytes (6TB) of storage capacity, I looked at 2 bay, 4 bay and 5 bay NAS enclosures. Generally a NAS doesn’t come with hard drives, the user will have to buy drives to suit their requirments. I needed to take into consideration the prices of different NAS boxes plus the cost of drives to suit their different configurations. 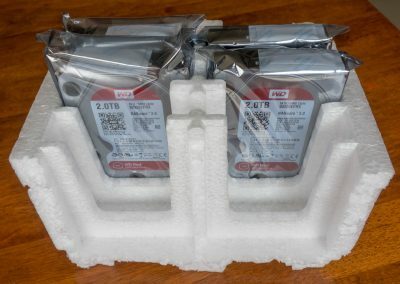 A 2 bay NAS is cheap, but I would need to buy two expensive 6TB drives to get my 6TB capacity with redundancy (data is replicated on both drives). A four bay NAS is a little more expensive, but I can fill it with four of the cheaper 2TB drives. The total 8TB capacity is reduced to around 5.5TB usable space in a RAID configuration that spreads your data across all four drives with redundancy which would allow one of those drives to fail without any loss of important information. When I looked at the sums, I worked out a four bay NAS was the best value. After reading various reviews of NAS enclosures, I’d narrowed my options down to devices from either Synology or QNAP. Even though QNAP was cheaper, every review I read said that Synology had the better software which made their NAS boxes easier to setup and use. So my decision was made, I would buy a Synology four bay NAS with four 2TB drives. After getting approval from the family Chief Financial Officer (my wife! ), we headed down to our friendly computer store (Centrecom in Clayton) only to be told the Synology was out of stock. Retail shopping can be really frustrating at times! Centrecom is a half hour drive from home, so I wasn’t about to leave empty handed. 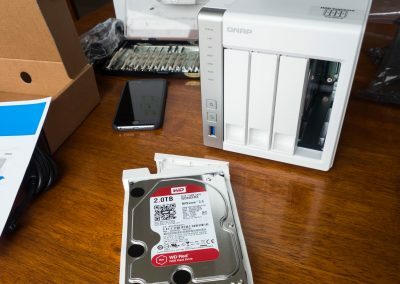 We purchased my second choice, the QNAP TS-431 and four Western Digital 2TB Red Drives. Installing the hard drives into the QNAP NAS couldn’t be much simpler, and only took a few minutes. With the drives installed, all that’s left is to plug in the power and network cables. 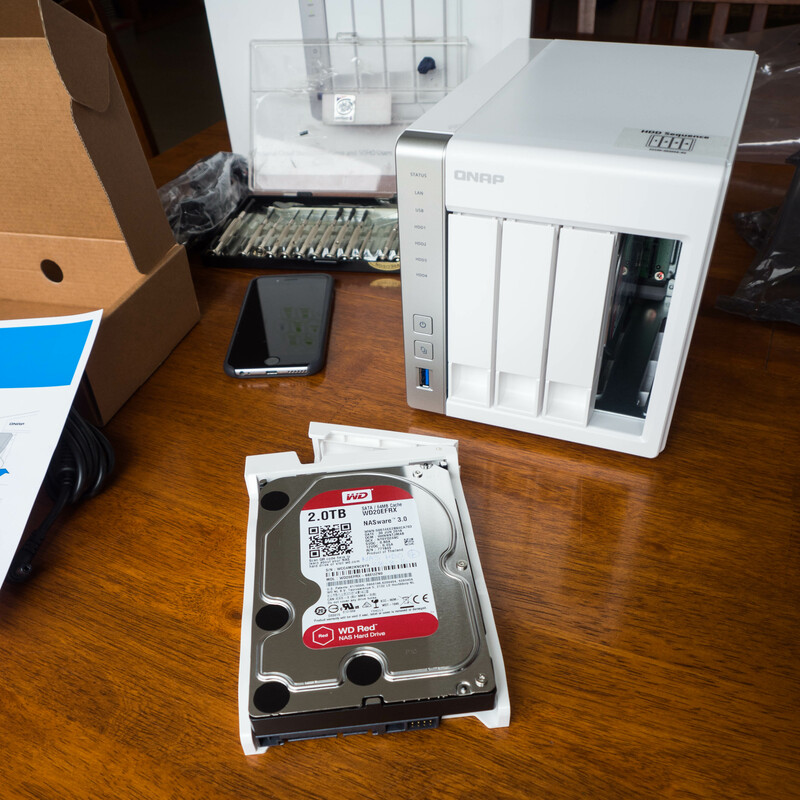 The QNAP doesn’t come with much instructions, other than to connect to a special URL – start.qnap.com – which will find the NAS on your network easily enough. You’re then prompted to install firmware, but after that it wasn’t really clear what I was supposed to do to complete my setup. After watching a few YouTube instructional videos about setting up a QNAP, I was able to setup a secure NAS user accounts and folders for everyone in the family. QNAP also have various apps, most of which will need to be downloaded and installed, for additional functionality. I wasn’t interested in apps, I just wanted storage. I now have over 5.5TB of network storage. With the NAS mapped to a drive letter on my computer, I can treat my network storage just like any other folder on my computer. I can also access the NAS from my phone or iPad while connected to my wifi network. If I’d wanted, I could even setup remote access over the internet. Getting almost 3TB of data across to the NAS did take considerable time, but when I looked at my home network traffic I could see data moving way faster than anything done online with cloud storage. Every user account on the QNAP gets their own recycle bin, so any file deleted is automatically backed-up in the network recycle bin – much safer than USB drives where data is permanently gone when you hit the “Delete” button. Having a family NAS drive for all of the household data storage is a great solution to safeguard valuable information such as photos. The files can be accessed from any device connected to the home network. Each member of the family can have their on password protected folders alongside shared folders. Your data is a lot safer on a NAS too. A drive failure in your computer, or the computer crashing wont result in the loss of valuable files stored on the NAS. A drive failure in the NAS wont loose your information either, if its multiple drives are setup in a RAID configuration (which is usually the default setting). 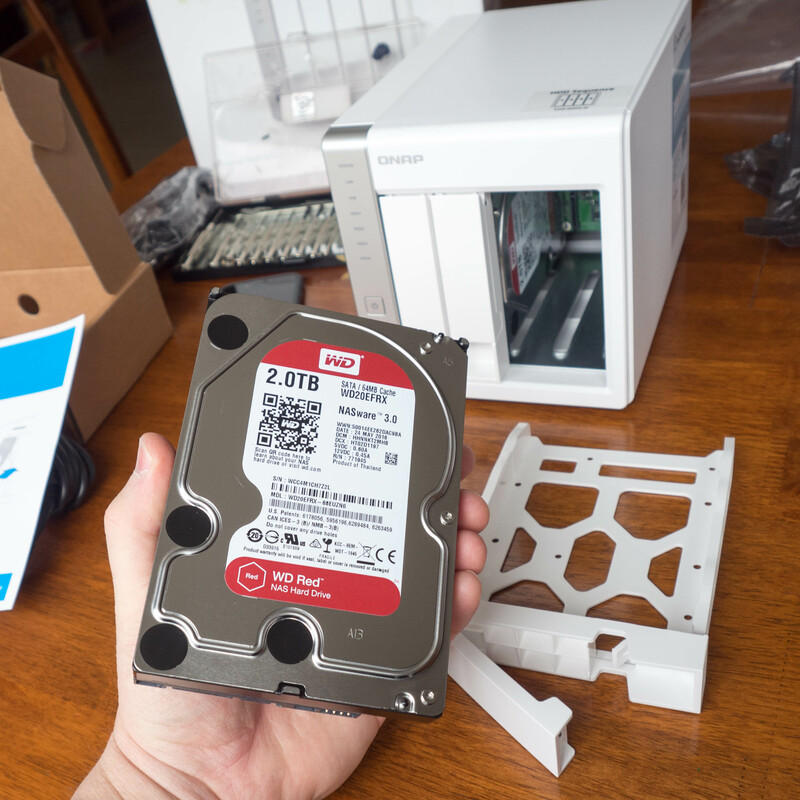 The only negative when it comes to getting a NAS for your data storage at home is the initial setup. While I had no problem installing the hard drives into the enclosure, some people may not be comfortable handling computer hardware. 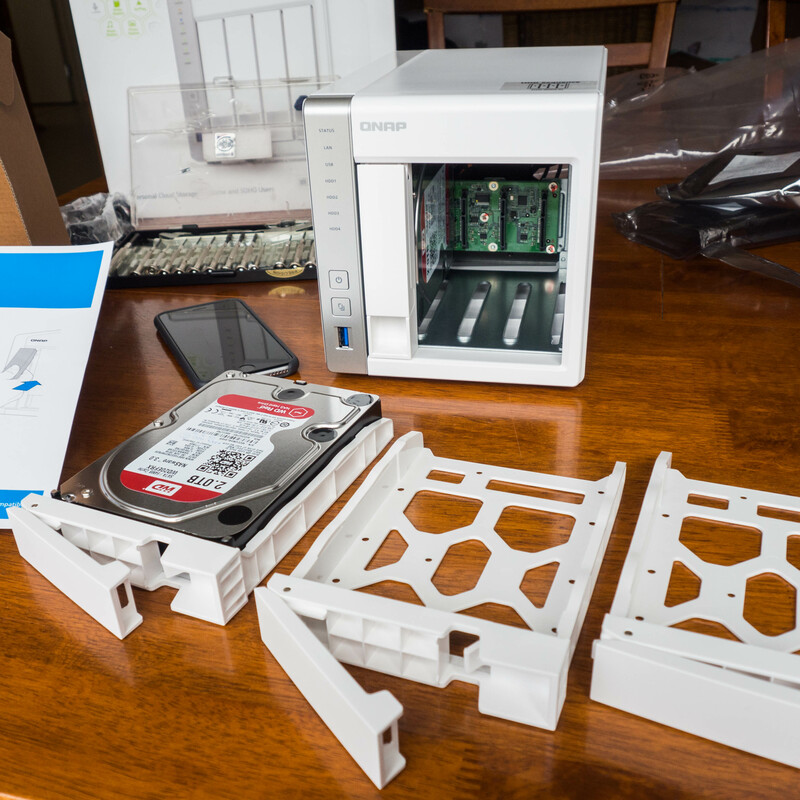 When it comes to setting up the NAS on your home network, QNAP’s lack of instructions made the process more difficult than it needed to be. Reports I’ve read suggest Synology NAS enclosures are easier to setup thanks to better software.